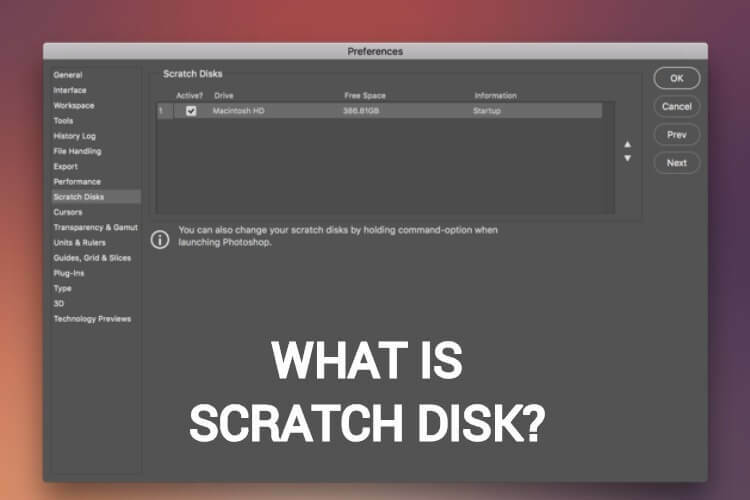 What is Scratch Disk and How to clear it? If you use macOS on a regular basis, working in image editing programs like Adobe Photoshop, you probably know the drill when it comes to the ‘scratch disk’ error occurrence. It’s the most common cause of Photoshop’s refusal to work in the way it should. If this problem sounds familiar, we’re going to show how to resolve it in a few simple steps. 1 What is a scratch disk? 2 Why does ‘scratch disk full’ error occur? Before we proceed with some solutions, it would be nice to describe what scratch disk is supposed to mean. In fact, it’s a portion of free space on a hard disk used in programs like Final Cut Pro or Photoshop. This space is used to store graphics that are too big for the computer’s random access memory to handle. As a rule of thumb, editing the image requires five times the size of that image. When your computer cannot use RAM to complete editing of the file, scratch disk stores the data on a temporary basis. When editing of the file is abandoned or completed, scratch disk space gets freed. Why does ‘scratch disk full’ error occur? Mac users receive this message when their image editing programs have used all the free memory on the hard drive. This used up storage is temporary and hundred-percent separate from the file you’re currently working on. Photoshop doesn’t always free up the temporary files even if there’s no need for storing them anymore, that’s why a permanent ‘full scratch disk’ problem occurs, and Mac users can’t find the solutions. If you’ve stumbled upon this article, you are probably among those users, who don’t know how to empty their scratch disk. So let’s find out. When Photoshop isn’t shut down properly, it can leave a whole lot of temporary files stored on your scratch disk. To clear your temporary Photoshop files, you can go two ways. The first is manual cleanup. All you need is to open Photoshop, click the Menu tab, hover the mouse over purge, and choose the item you want to delete – Clipboard, Undo, Histories or All. Before proceeding, make sure you don’t need any of your previous project files. If the item is grey-colored – it has already been deleted. The second way is using an app like CleanMyMac 3, it can help you to prevent your Photoshop files from pilling up by scheduling regular cleanings. To give this method a try, download and install the app. Then launch it, go to Scheduler tab and choose how often do you want to receive reminders – like, every week or so. When a cleaning process is due, the program will process a pop-up reminder. When this message appears, just launch the program and let it do its job, clearing your Photoshop cache and other trash on your system. To delete such temporary files, find Temp#### files on your Mac and get rid of them. #### stands for a series of numbers, and you can easily delete all these files. No worries – it’s safe. To give this method a try, go to Mac drive and find some useless files – those you don’t want or need to keep any longer. For your old photos, videos, or audios, you can get rid of them by transferring them to your cloud storage or an external drive. This will free up your disk space instantly. Ideally, hard drives should never be above 85% capacity. If you’ve noticed speedily depleting the space on your hard drive – you can easily change the scratch disk to any other drive. click on the Photoshop button. open Preferences and go to Scratch Disk. Select an option from the checkbox and click OK.
Whatever solution you used to free up your memory and fix the ‘scratch disk full’ error, now you can come back to your editing programs, which work as smoothly as ever.